Recently it has been fairly cold for Texas. The temperatures drop down into the low 30’s at night and into the low 40’s during the day. It’s not so bad until you add rain and high winds. Then it’s downright freezing. 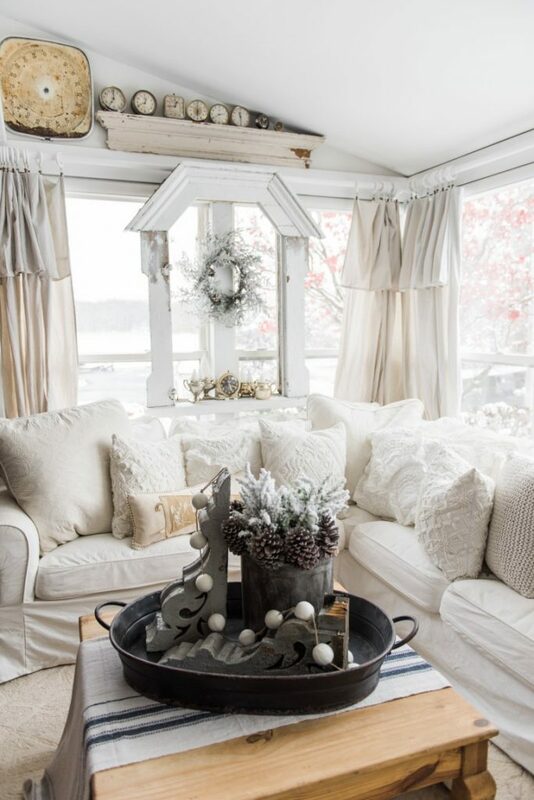 It has me thinking about Cozy Winter Decor. If you are visiting via Our Southern Home may I say “Welcome!”. Christy’s home is so lovely all the seasons. But winter might just be my favorite. A HUGE “Thank you!” to dear Amber from Follow The Yellow Brick Home for organizing this collection of cozy. During the month of January, various shades of white, silver and gold seem so appropriate. 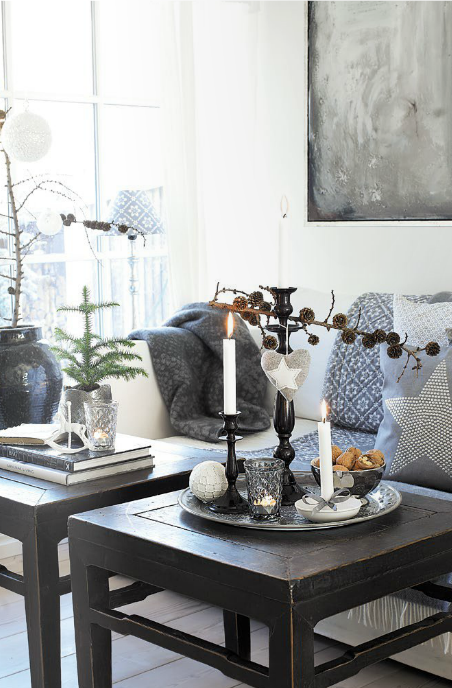 Adding candles or fairy lights always creates a bit of cozy. 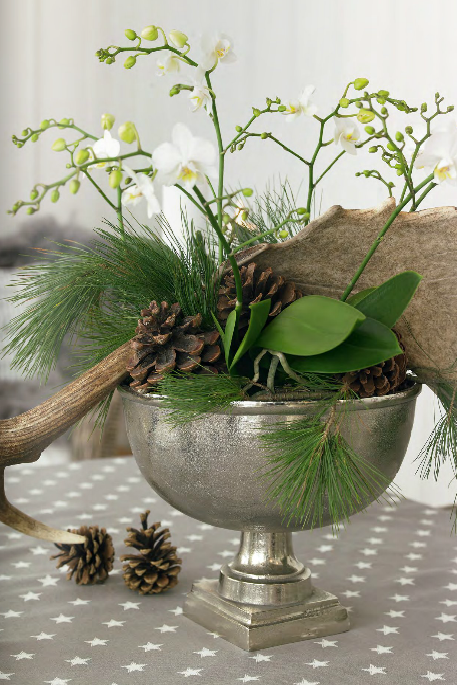 A bit of greenery always helps to brighten a gray day even AFTER the holiday season. 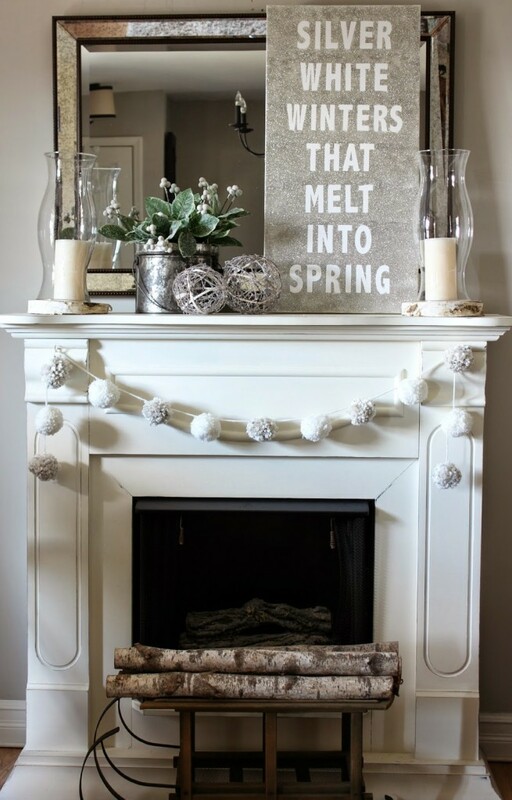 Bringing elements from the outside inside is a fun and frugal way to decorate in winter. 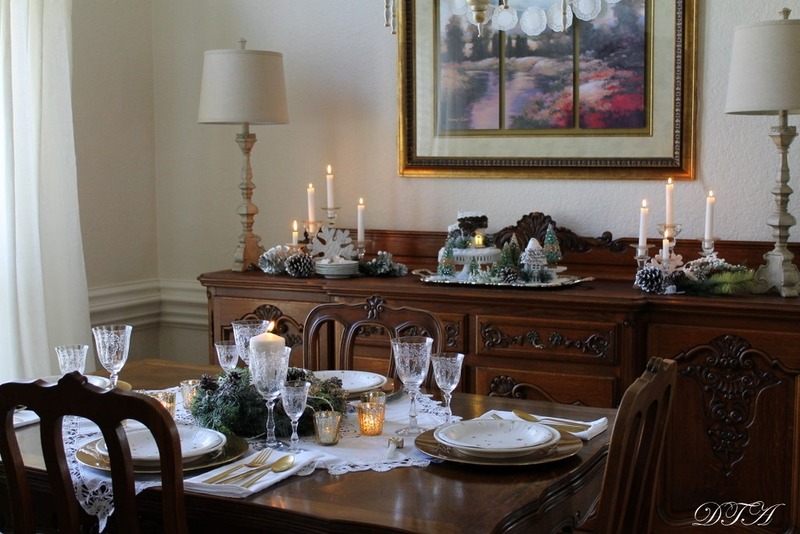 In my own home, a cozy winter scene was created in the formal dining area. 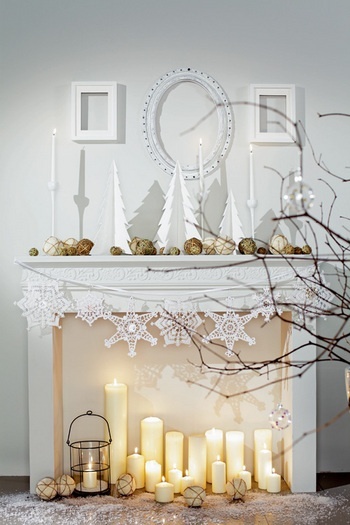 It includes a cool color palette, a bit of candlelight, natural elements and a few snowflakes. The porch decor you saw in December is still in place. The bed is still dressed in same soft ethereal look it had at Christmas time. I feel that January should be a slow month. I’m in no hurry. That is the ultimate in COZY. Next on the tour is Art & Sand. Her sweet cottage always provides a bright spot of color on even the dreariest of days. 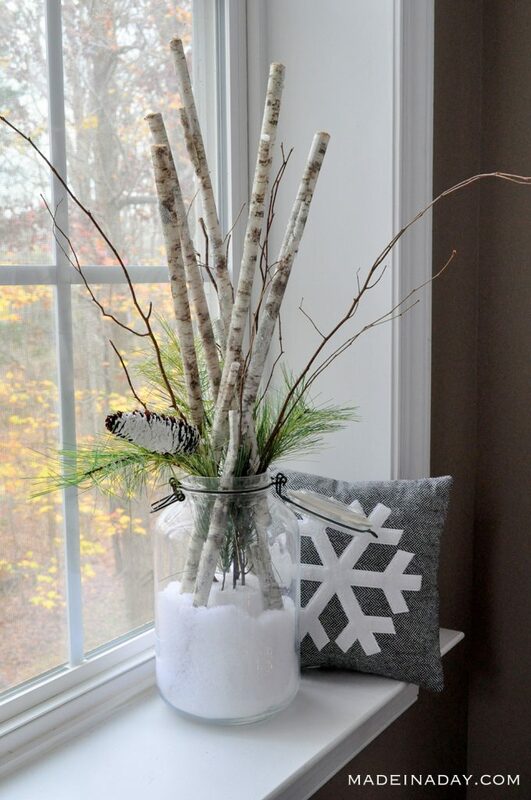 You can find additional winter decor ideas by clicking on the links below. 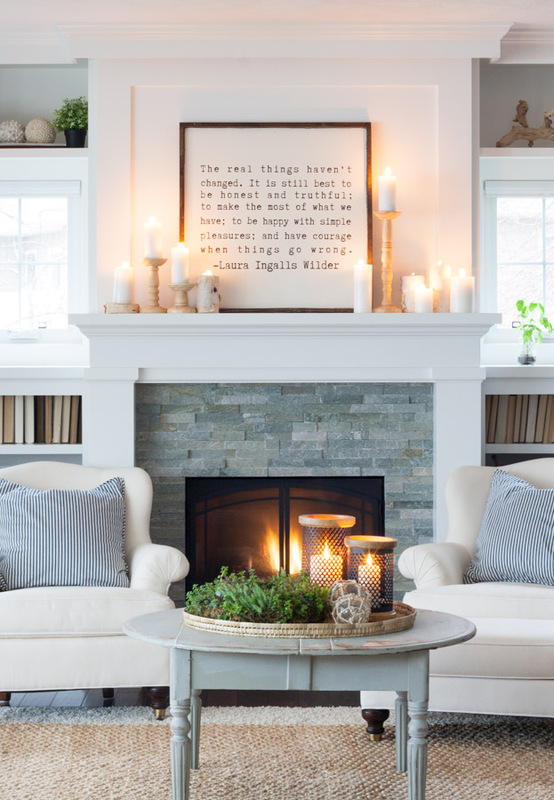 I love your collection of neutral winter decor ideas which say “get cozy and stay awhile” to me. So happy to be on the blog hop with you. Stay warm! 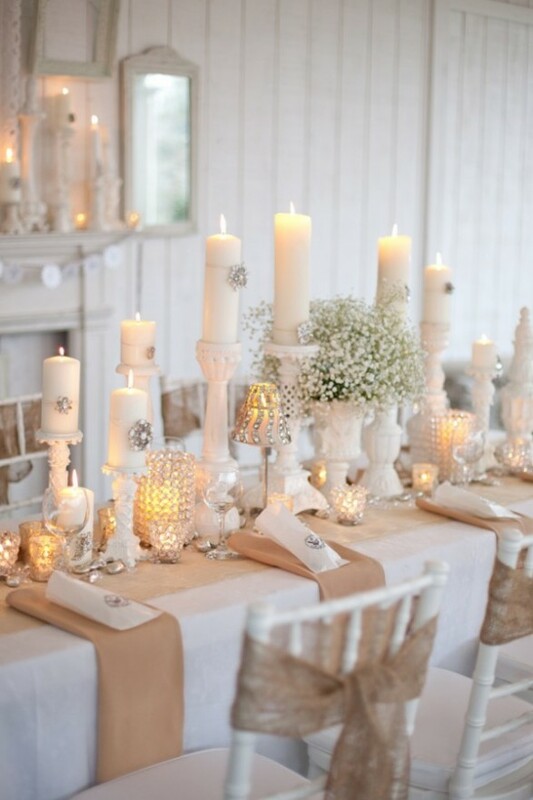 I love the table setting with all the different white candles . Actually I love all of your different table settings. Great inspiration Laura! Don’t you think we need some snow? I think this may be the first year we don’t actually get any. Total bummer. Glad your porch still looks inviting too. Stay warm! So much inspiration! I love your winter home and all the warmth it has. Such pretty inspiration. 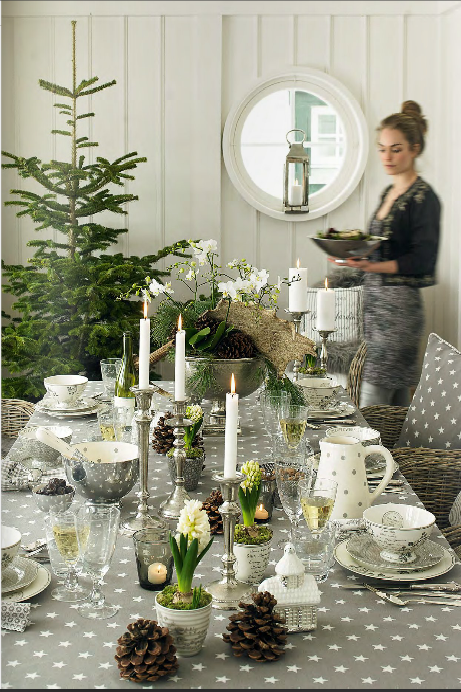 You dining room setting is especially pretty. I love your tablesetting. I also really like how you always add such interest to your porch, it just invites you in. The candles and the wood/pinecone accents are my favorites! Laura, I want to come sit on your porch and have a cuppa tea…. so inviting. Your dining room reminds me of home and is so cozy. You have a unique way with different textures and materials and I love that you didn’t feel the need to change out your bedroom as it is perfect as is. Sorry, but all of the gray, white and silver shiny and sparkling winter decor is too much for this Indiana resident. In January, our skies are gray, our ground is either snow covered (dirty gray after 1 day) or gray frozen ground. 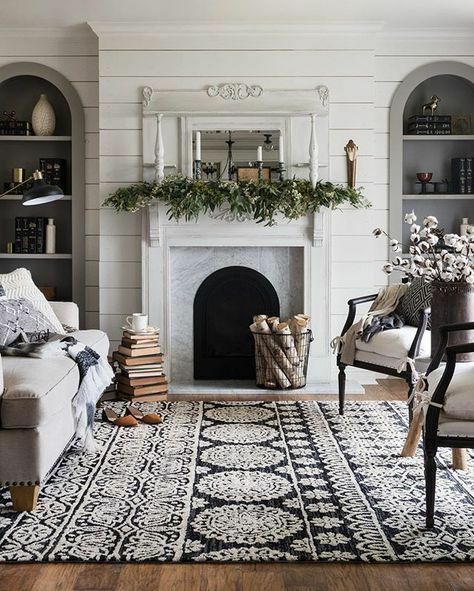 I’m all for trying to make lack of color “cozy,” but in place of shiny and more white, show me something green; show me textures such as firewood and brick; show me cable knit throws; show me lavender even if it’s fake; and show me a promise of Spring. I’m in seasonal depression already ….. Yikes. I love your etched glasses, Laura! 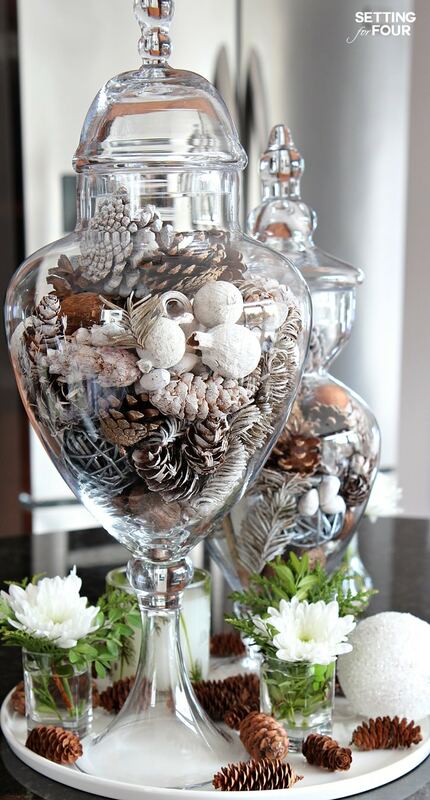 So perfect for a wintertime table setting. I also love your wintry porch vignette with the brick backdrop. Fun to be hopping with your again! 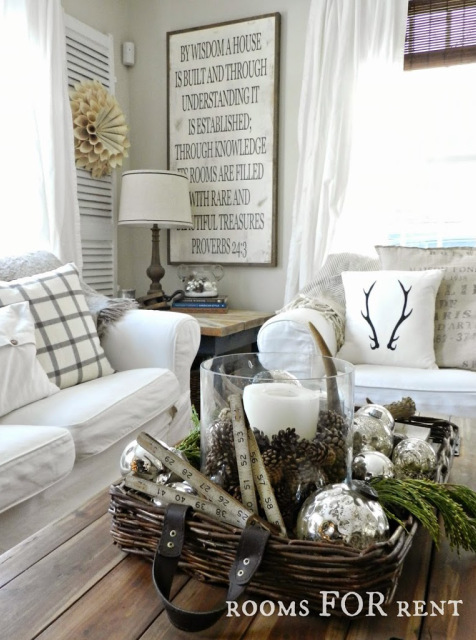 What a great collection of ideas for winter decorating. You dining room looks so pretty, I especially admired your pretty glasses. 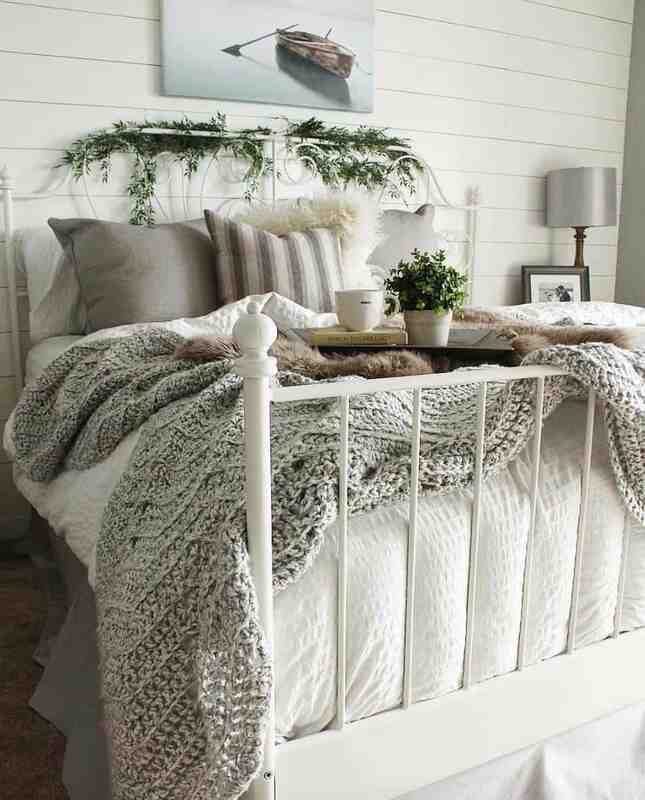 I also love your cozy winter bedroom. 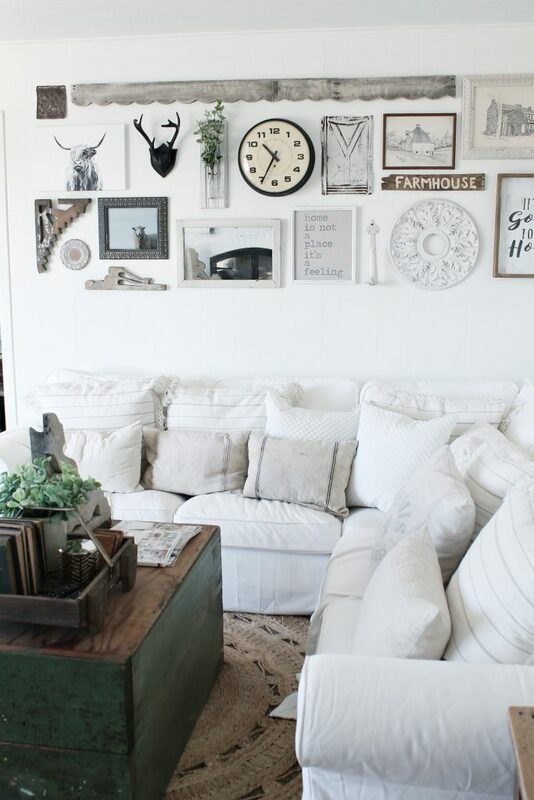 So many beautiful decor ideas! Laura, All these photos had so much inspiration for me, but your porch totally wows me in more ways than one. It’s so stunning and I can see why it’s still the same way. Christy has a lovely home, I used to follow her. So glad to see some of her changes. I have to come back to see some of the other homes featured! Oh my goodness there is so much eye candy and so many wonderful images to pin. I agree that January should be slow and calm! 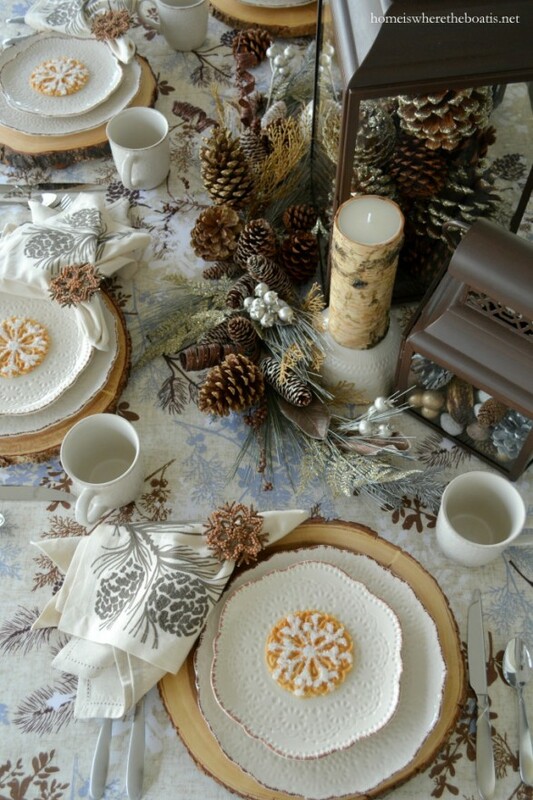 I love your cozy bedroom and your wintry tablescape. As always, you have inspired with you eye for style! Thank you so much for joining the Cozy Winter Homes blog hop. May you have much needed calm peace and serenity throughout the winter months ahead. 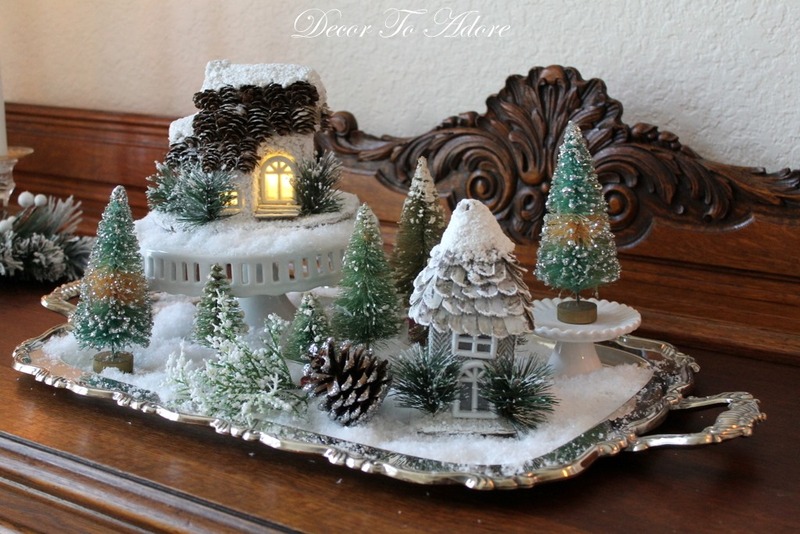 Laura, you have shared such wonderful ideas for winter decor. 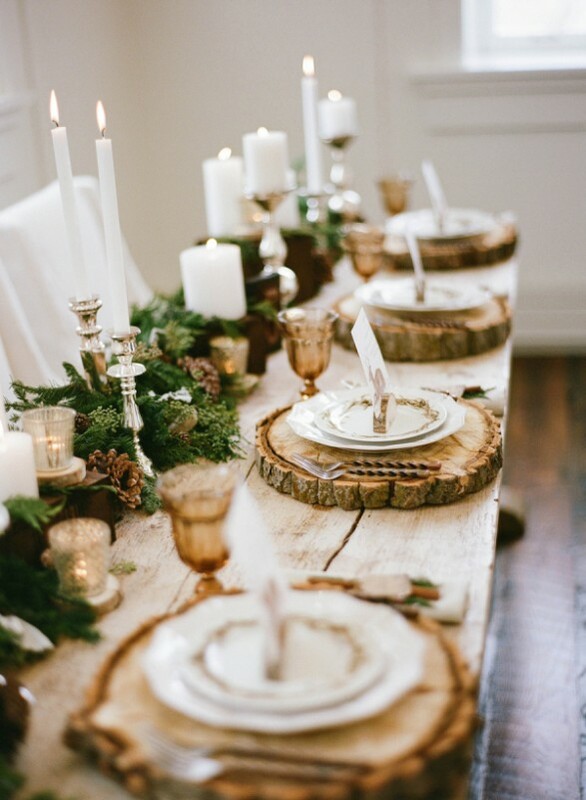 Your winter tablescape is stunning! It has been so much fun being on this tour with you! 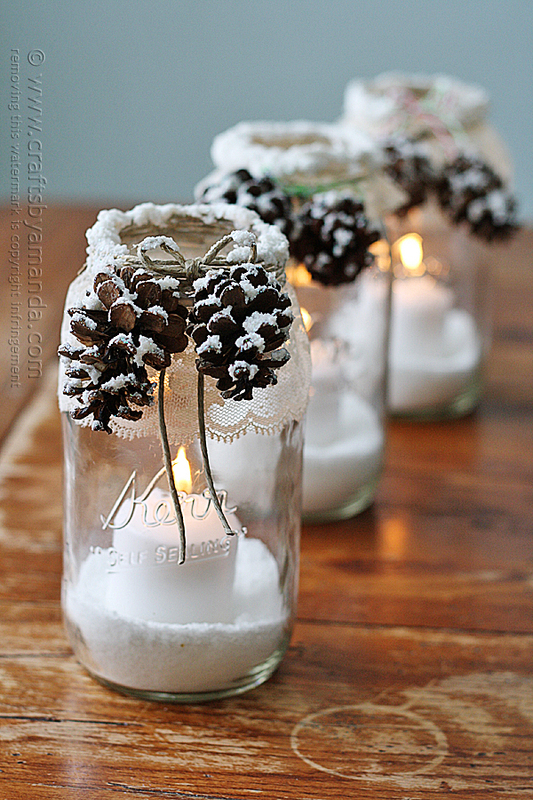 Beautiful collection of ideas for the winter season! Your dining room is so elegant, yet cozy! I love all these ideas!! So many to Pin and remember! I love the Laura Ingalls Wilder sign and that Silver White Winters sign. 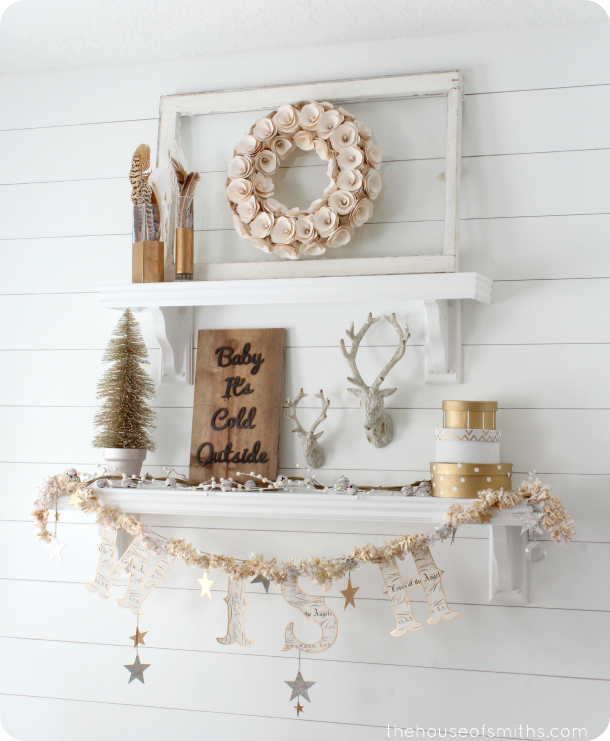 All so perfect for making the decor this time of year special too!